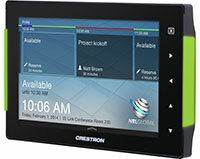 Crestron's TSS-752 room scheduling touchscreen is a 7-inch widescreen color display designed to provide at-a-glance meeting and scheduling information. The unit features new side-mounted, multi-colored LEDs that act as beacons to indicate room availability from afar. Crestron's Smart Graphics system powers a gesture-driven user experience with customizable room scheduling capabilities. A scrolling calendar ribbon allows users to swipe to reveal a room's entire schedule for the day. Users can view meeting details and reserve a room on the spot without having to flip through multiple screens. Crestron Fusion software enables integration with popular scheduling applications such as Microsoft Exchange, Office 365, IBM Notes, CollegeNet R25 and Google Calendar. It also supports the use of room occupancy sensors to detect when no one has shown up for a scheduled meeting. In such an event, the current reservation can be cancelled automatically to make the room available to others. If a meeting ends earlier than scheduled, a touch of the "End Now" button makes the room available to others immediately. A "Find Room" function allows users to quickly locate an available space nearby. Room reservations can be ended or extended with one button touch; extra setup time can be reserved ahead of an actual scheduled event. The panels also display broadcast messages sent from Crestron Fusion for emergencies or notices, such as an upcoming fire drill. The TSS-752 can be installed on a wall over a standard 2-gang electrical box, or mounted to a flat surface (including glass, granite or marble). An optional Mullion Kit (shipping soon) allows the TSS-752 to mount and route its cabling to any hollow vertical support, or to a door jamb. A single Ethernet cable with PoE technology delivers operating power to the TSS-752 through the LAN wiring. For more information, visit the Crestron site.